Hello all, I am new to the forum. I have a Gibson dreadnought that was handed down to me from my grandfather. He had a pawn shop in El Paso, TX back in the 40s. A musician pawned this guitar. I have been told this was before WWII. The guitar has no serial number or anything I can use to identify it. It is pretty beat up. My dad and his brothers played with it when they were kids. He said he remembers it being a really beautiful guitar. Unfortunately, it was cracked and someone glued the crack back together. It still sounds and plays beautifully though. Anyway, I am hoping someone can help me know more about this guitar. Thank you! 30's/40's era Southern Jumbo? The belly down bridge might be a replacement, but someone here might know better. You have a top of the heap vintage guitar there. Awesome! There could be a trace of a faded number up inside where the neck attaches to the bod, called the neck block. '46 or early '47 Southern Jumbo. Post banner/pre block headstock logo. Quite the nice guitar - well worth a trip to a good luthier. Numbers during those years sometimes didn't appear on the guitar. Thanks for the replies. Does anyone have a luthier they would recommend in the Atlanta/Athens area of Georgia? Thanks! it's a '46 or early'47 SJ, as the old cowpoke says. The belly-down bridge is correct for the period, jedzep. The tuners are not original. Your best bet in Atlanta is to call the stores that sell vintage guitars, and ask who the best person is to do significant structural repairs on a 1946 Gibson Southern Jumbo. If you repeatedly get the same recommendation, you've found your guy or gal. I say "significant" because it looks like you have a big crack around the body, from the shot looking down from the headstock along the neck. That will require careful evaluation, and is not a job that should be attempted by anyone without a lot of experience in vintage Gibsons or Martins. If you decide you don't want to take on the repairs after you get it evaluated, message me here. I'm a sucker for Gibsons of this period that need loving care. The guitar looks like it has had a hard life, but I'm the same vintage, and I don't look much if any better. Thanks for the advice. How much would this guitar be worth? My dad said he had a guitar shop offer him 5K a few years back. I figure if they offered that, it’s probably worth a good bit more than that. I don’t know that I would want to sell it or not, but if it is going to cost a mint to get it repaired, I might. Good one, Jim. This should give Eric a decent array of examples. He'll just need some stellar repair work on the wraparound side crack. I've owned two guitars in the past cracked that way. Both fixed so you could barely detect, so I know it can be done. Note that these two guitars have already had the structural issues addressed, and might represent the value of your guitar after the necessary repairs are made. Note also that one of those guitars has been on the market for more than three years, so it is clearly overpriced. The value of your guitar today, before repairs are made, is anyone's guess. Anyone looking to buy it will want a careful examination by a qualified luthier before making an offer. What we don't know is what we can't see when it comes to your guitar. Until you get a proper evaluation of the necessary repairs, you're not going to have an answer. If I had to make an offer based on what I can see from those photos, it would be a fraction of what those other two guitars may have sold for after repairs, since I wouldn't know what I might be getting into. A qualified vintage guitar repair specialist is going to charge $75-$100 per hour to make repairs. It will be a time and materials repair. High-quality major structural repairs aren't cheap. Note also that one of those guitars has been on the market for more than three years, so it is clearly overpriced. Note that the listings for both of the guitars I linked to ended at some point in the past. Neither is still available, so suggesting that one "has been on the market for more than three years" sounds a bit presumptuous, unless you have specific knowledge from having followed this listing yourself. They may or may not have sold for the indicated prices (? I'm not sure how Reverb works in this respect, nor do I know how long they leave completed listings up on the site), but I'm not sure how we necessarily know that one was "clearly overpriced" based on the data presented. I'll always defer to you (and the other members who posted above) when it comes to flat tops, and I agree with everything else you said. I was just trying to offer some help, and only posted the two links for general reference purposes. Sorry, I saw that one had ended, but not the other. Note that the listing did say it had been listed "almost three years ago", so it was on the market for a long time. Any otherwise desirable guitar that is on the market for three years has been over priced. 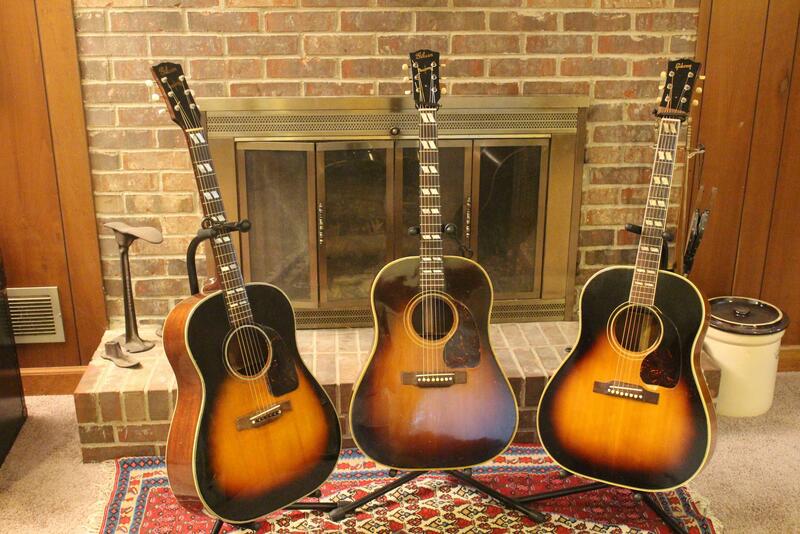 We live in Atlanta and we have been collecting vintage guitars for 40 years. We are not buying or selling now, but I think it is fair to say we have lots of experience with old guitar maintenance and repair. We have three old SJs -- 43, 43 and 54. These are valuable guitars, but mid range for us. It is almost certainly what was said -- 46 SJ -- but there is a tiny chance it is a 42. I would need to see it. The man I would use to fix it is Randy Wood in Savannah. He is not only reasonable but also famous. When you have an old guitar restored, the reputation of the luthier is very important. In any case, I would be glad to advise you. You can message if you like.